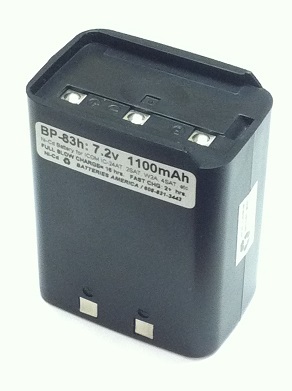 Home > Commercial-Land Mobile-Marine > BP-83h : 7.2v 1100mAh rechargeable Ni-Cd battery pack for ICOM radios. 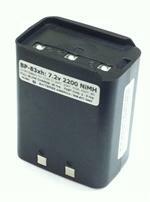 BP-83h : 7.2 volt 1100mAh rechargeable Ni-Cd battery pack for ICOM amateur, commercial, marine, and aviation HT radios. Replaces BP-83, BP-84, BP-82, BP-81, CM-89. Battery is same height as original BP-83, but provides much more operating time. Fits radios such as IC-24AT, IC-2SAT, IC-3SAT, IC-4SAT, IC-W2A, IC-2SRA, IC-4SRA, IC-M7, etc. This battery can be re-charged thru the radio (if so equipped) OR in a desktop charger such as the BC-79A or our EMS-79A.